In the limnology program at Baylor, we are investigating factors that govern rates of production among bacterio- and phytoplankton in lakes and reservoirs. These factors include suspended clay, dissolved oxygen and the structure of the predator community. 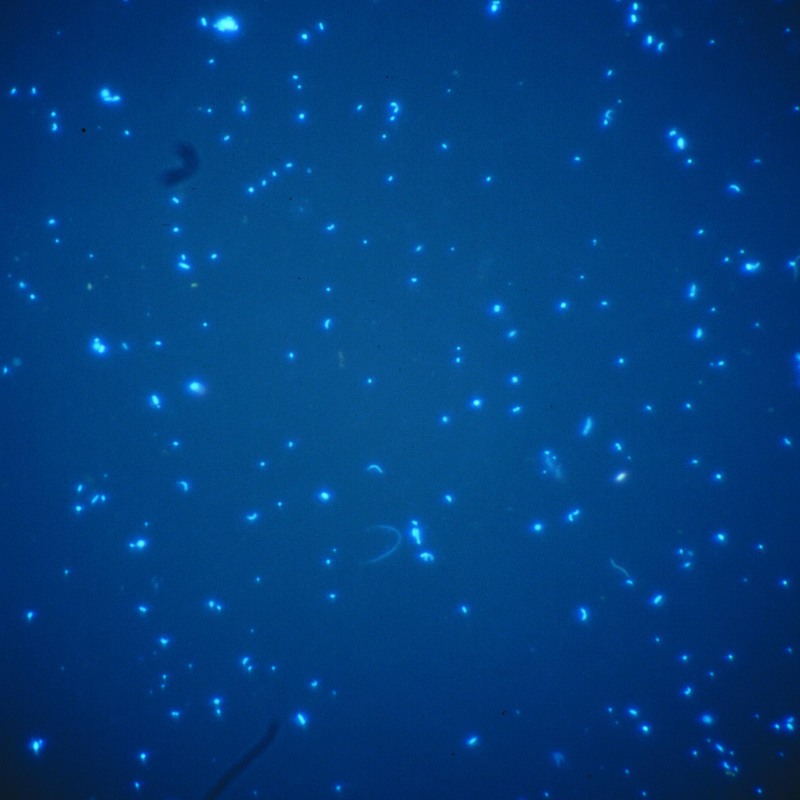 Small particles formed by either bacteria or phytoplankton are the base of aquatic food webs. Thus the rates of such production are determined by an array of biotic and abiotic factors operating from the “bottom-up”, such as nutrient and substrate supply and light, and factors operating from the “top-down”, such as predation and parasitism. We have determined that suspended clay modifies each of these systems– it competes for nutrients, reduces the light field, modifies the thermal regime, both facilitates and interferes with predation, and facilitates and interferes with contaminant uptake. In density-stratified lakes and reservoirs, one observes a gradual decline in hypolimnetic (deep-water) dissolved oxygen concentration of water and sediments. This type of change greatly modifies the biotic community of the deep water during stratification and of the entire lake following mixing. We are examining how the community changes during oxygen change and asking the following questions: Are microaerophilic (requiring oxygen at a lower level than that found at sea-level) and anaerobic bacterioplankton capable of production equal to the aerobes? Are they subject to the same predation pressure? How quickly does the community structure reform following aeration? Aquatic predators (such as protozoa, rotifera, microcrustacea, and fish) are important in determining the accumulated biomass of the producers. The relative importance of different species differs both within and among lakes and reservoirs. We are investigating the abiotic and biotic factors of the ecosystem responsible for such differing predator efficiencies; i.e., what is responsible for such differences and consequently for the differing ability to control bacterio- and phytoplankton production and accumulation? Phytoplankton taxonomic composition changes during succession from more oligotrophic to more eutrophic states in lake and reservoirs. 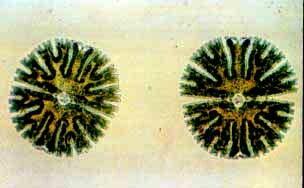 Such patterns are preserved in the lake sediments and are the subject of much paleolimnology. Whereas such changes may occur over centuries in natural lakes, reservoirs may undergo such changes in decades. Waco Reservoir is a particularly suited because the present reservoir is situated directly on top of an earlier reservoir. This permits the question “does history repeat itself?”; i.e. is the sequence of taxa found in recent sediments similar in pattern with the sequence found in the first reservoir's sediments? We hope to relate taxonomic patterns to changes in the reservoir's catchment. Reservoirs often have algal blooms – the result of excessive fertility, lack of grazing, or both. This research evaluates the role of zooplankton in governing algal mass in clay-turbid water, and evaluates biomanipulation as a management strategy for the control of algae. Waco Reservoir provides a site for such research. It is hypothesized that the zooplankton differs between the two major arms of the reservoir, within each arm from headwaters to dam, and with water turbidity in either arm. We are conducting laboratory studies of algal food selectivity by these taxa with expanded grazing experiments to quantify the depression in grazing efficiency induced by the presence of clay suspensoids. Following laboratory experiments, limnocorral (large experimental cylinders) experiments will be conducted in the reservoir along the reservoir axis to provide different nutrient, turbidity and trophic conditions. Bacterioplankton and phytoplankton are linked – bacteria regenerate essential elements for algal use and algae provide organic substrate for bacteria use. But bacteria and algae also depend on many of the same elements, creating a competition. This research evaluates the role of bacterioplankton in governing phytoplankton mass though competition for the growth-limiting nutrient element, phosphorus (P). Waco Reservoir, a phosphorus-limited system, provides the site for this research. Quantitative bacterioplankton samples are collected from multiple regions and depths and bacterial biomass determined. 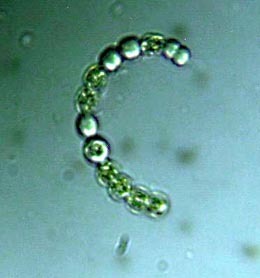 Bacterioplankton are preyed upon by protozoa and some cladocera. The protozoa abundance will be determined. Cladocera abundance data will be obtained from the concurrent study of Dr. Carlos Lopez. Bacterioplankton abundance reduction will be measured by clearance of bacterioplankton from the media. Change in bacterioplankton number and cell size (selective predation) will be quantified by flow cytometry confirmed by epifluorescence direct counts and measurements. We will then expand the predation experiments to quantify any change in predation efficiency induced by the presence of clay suspensoids. 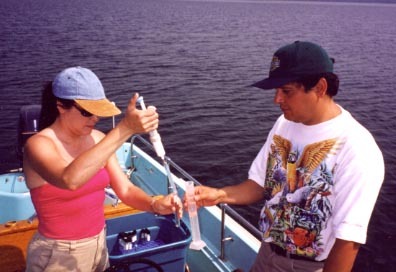 Algal and bacterial growth bioassays will measure the interaction of these two plankton. Niche partitioning is a topic of interest for community ecologists. Taxonomic diversity is determined by the number of niches. Tropical lakes often have a high number of closely related (congeneric) fish species occupying what is apparently the same habitat. How species partition the resources to minimize competition is an important question to answer when trying understand community structure. 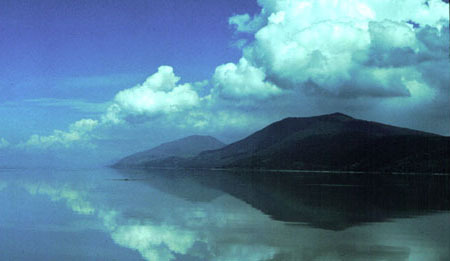 For example, in Lake Chapala, Mexico (pictured, right), there is a “species flock” of eight atherinid fishes of the genus Chirostoma. There is low primary productivity thus food resources are limited and it is presumed that efficient foraging has evolved. We have determined that some of the species consume bacteria associated with clay aggregates and that aggregates vary in size and abundance across the large lake. We are testing the hypothesis that niche partitioning in the Chirostoma is a function of suspended clay and clay aggregate abundance and the associated environmental conditions. 1 - What is the quantitative difference in primary and secondary (resuspended) sedimentation? 2 - What is the relation of resuspension to wind speed and direction (fetch)? 3 - How does lake bottom morphometry (in this case a submerged old dam) affect resuspension? 4 - What is the percent organic component if suspensoids? How does the phytoplankton (diatom) component of sedimenting materials vary spatially and seasonally? These abiotic (nonliving) factors govern phytoplankton production and have been modeled before. However, few models that predict production based on the interaction effect exist. Elongated reservoirs are particularly well suited to test this type of model because of gradients in nutrient concentrations, clay turbidity, and mixing depth – all components of the model. Contradictory properties are phytoplankton composition and the velocity of vertical mixing. The sediment-water interface, or the boundary between the two, is an important property of lake and reservoir productivity. Nutrient- and contaminant-rich sediments can be separated from the water communities by this interface. However, during periods of anoxia (absence of oxygen) the separation is weaker, and materials move from one phase to the other. The bacterial community plays an important role in both the formation of anoxia and the subsequent mobilization of materials in the water. We are interested in community dynamics, specifically during the transitions between oxic-anoxic and anoxic-oxic. Most eutrophication-promoting nutrients enter lakes and reservoirs via stream flows often enriched by agricultural and wastewater nutrients. We proposed that stream periphyton function as temporal modulators of nutrient inputs; nutrients washed from the land during storm pulses are taken up by stream periphyton and then released gradually to the reservoir. However, storm flows also are accompanied by high clay loads. Clays may be both sources and sinks of nutrients such as phosphorus and thus clearly interact with periphyton and its ability to act as a nutrient pulse modulator.